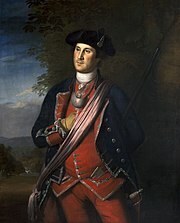 Washington received his initial military training and command with the Virginia Regiment during the French and Indian War. He was later elected to the Virginia House of Burgesses and was named a delegate to the Continental Congress, where he was appointed Commanding General of the nation's Continental Army. Washington led American forces, allied with France, in the defeat and surrender of the British at Yorktown, and resigned his commission in 1783. 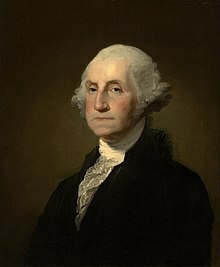 Washington played a key role in the adoption and ratification of the Constitution and was then elected president by the Electoral College in the first two elections. 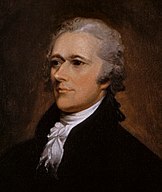 He implemented a strong, well-financed national government while remaining impartial in a fierce rivalry between cabinet members Thomas Jefferson and Alexander Hamilton. 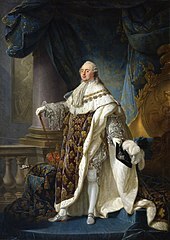 During the French Revolution, he proclaimed a policy of neutrality while sanctioning the Jay Treaty. To pacify the South and preserve national unity, the president and Congress passed legal measures that protected slavery. He set enduring precedents for the office of president, including the title "President of the United States", and his Farewell Address is widely regarded as a pre-eminent statement on republicanism. 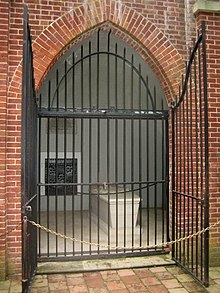 Washington utilized slave labor, owning and trading African American slaves, but he became troubled with the institution of slavery and freed them in his 1799 will. He endeavored to assimilate Native Americans into Western culture, but responded to their hostility in times of war. He was a member of the Anglican Church and the Freemasons, and he urged tolerance for all religions in his roles as general and president. Upon his death, he was eulogized as "first in war, first in peace, and first in the hearts of his countrymen." He has been memorialized by monuments, art, geographical locations, stamps, and currency, and many scholars and polls rank him among the top American presidents. Washington's great-grandfather John Washington immigrated in 1656 from Sulgrave, England to the British Colony of Virginia where he accumulated 5,000 acres (2,000 ha) of land, including Little Hunting Creek on the Potomac River. 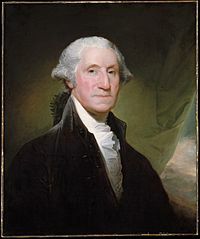 George Washington was born February 22, 1732 at Popes Creek in Westmoreland County, Virginia, and was the first of six children of Augustine and Mary Ball Washington. His father was a justice of the peace and a prominent public figure who had three additional children from his first marriage to Jane Butler. The family moved to Little Hunting Creek, then to Ferry Farm near Fredericksburg, Virginia. When Augustine died in 1743, Washington inherited Ferry Farm and ten slaves; his older half-brother Lawrence inherited Little Hunting Creek and renamed it Mount Vernon. In February 1754, Dinwiddie promoted Washington to lieutenant colonel and second-in-command of the 300-strong Virginia Regiment, with orders to confront French forces at the Forks of the Ohio. Washington set out for the Forks with half of the regiment in April but soon learned that a French force of 1,000 had begun construction of Fort Duquesne there. In May, Washington had set up a defensive position at Great Meadows when he learned that the French had made camp 7 miles (11 km) away. Washington decided to take the offensive in pursuit of the French contingent. The French detachment proved to be only about 50 men, so Washington advanced on May 28 with a small force of Virginians and Indian allies to ambush them. [e] What took place was disputed, but French forces were killed outright with muskets and hatchets. French commander Joseph Coulon de Jumonville, who carried a diplomatic message for the British to evacuate, was mortally wounded in the battle. French forces found Jumonville and some of his men dead and scalped and assumed that Washington was responsible. Washington placed blame on his translator for not communicating the French intentions. Dinwiddie congratulated Washington for his victory over the French. The "French and Indian War" was ignited—which later became part of the larger Seven Years' War. In 1755, Washington served voluntarily as an aide to General Edward Braddock, who led a British expedition to expel the French from Fort Duquesne and the Ohio Country. On Washington's recommendation, Braddock split the army into one main column and a lightly equipped "flying column". 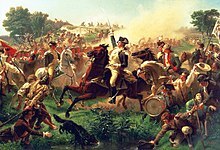 Suffering from a severe case of dysentery, Washington was left behind, and when he rejoined Braddock at Monongahela, the French and their Indiann allies ambushed the divided army. The British suffered two-thirds casualties, including the mortally wounded Braddock. 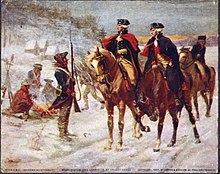 Under the command of Lieutenant Colonel Thomas Gage, Washington, still very ill, rallied the survivors and formed a rear guard, which allowed the remnants of the force to disengage and retreat. During the engagement he had two horses shot from under him, and his hat and coat were bullet-pierced. His conduct under fire redeemed his reputation among critics of his command in the Battle of Fort Necessity, but he was not included by the succeeding commander Colonel Thomas Dunbar in planning subsequent operations. In 1758, the Virginia Regiment was assigned to Britain's Forbes Expedition to take Fort Duquesne. [f] Washington disagreed with General John Forbes’ tactics and chosen route. Forbes nevertheless made Washington a brevet brigadier general and gave him command of one of the three brigades that would assault the fort. The French abandoned the fort and the valley before the assault was launched, with Washington seeing only a friendly-fire incident which left 14 dead and 26 injured. The war lasted another four years, but Washington resigned his commission and returned to Mount Vernon. Under Washington, the Virginia Regiment had defended 300 miles (480 km) of frontier against 20 Indian attacks in 10 months. He increased the professionalism of the regiment as it increased from 300 to 1,000 men, and Virginia's frontier population suffered less than other colonies. Some historians have said this was Washington's "only unqualified success" during the war. Though he failed to realize a royal commission, he gained valuable knowledge of British tactics, self-confidence, and leadership skills. The destructive competition Washington witnessed among colonial politicians fostered his later support of strong central government. On January 6, 1759, Washington, at age 26, married Martha Dandridge Custis, the 28 year-old widow of wealthy plantation owner Daniel Parke Custis. The marriage took place at Martha's estate; She was intelligent and gracious, and experienced in managing a planter's estate, and the couple created a happy marriage. They raised John Parke Custis and Martha Parke (Patsy) Custis, children from her previous marriage, and later their grandchildren Eleanor Parke Custis and George Washington Parke Custis. Washington's 1751 bout with smallpox is thought to have rendered him sterile, and they lamented the fact that they had no children together. They moved to Mount Vernon, near Alexandria, where he took up life as a planter of tobacco and wheat and emerged as a political figure. As a respected military hero and large landowner, Washington held local offices and was elected to the Virginia provincial legislature, representing Frederick County in the House of Burgesses for seven years beginning in 1758. He plied the voters with beer, brandy, and other beverages, although he was absent while serving on the Forbes Expedition. He won election with roughly 40 percent of the vote, defeating three other candidates with the help of several local supporters. He rarely spoke in his early legislative career, but he became a prominent critic of Britain's taxation and mercantilist policies in the 1760s. Washington believed that the Stamp Act of 1765 was an "Act of Oppression", and he celebrated its repeal the following year. [g] In March 1766, Parliament passed the Declaratory Act asserting that Parliamentary law superseded colonial law. Washington helped to lead widespread protests against the Townshend Acts passed by Parliament in 1767, and he introduced a proposal in May 1769 drafted by George Mason which called Virginians to boycott English goods; the Acts were repealed in 1770. As Washington headed for Boston, word of his march preceded him, and he was greeted by local officials and statesmen, gradually becoming a symbol of the patriot cause. [h] Upon arrival on July 2, 1775, two weeks after the patriot defeat at nearby Bunker Hill, he set up his Cambridge, Massachusetts headquarters and inspected the new army there, only to find an undisciplined and badly outfitted militia. After consultation, he initiated Benjamin Franklin’s suggested reforms—drilling the soldiers and imposing strict discipline, floggings, and incarceration. Washington ordered his officers to identify the skills of recruits to ensure military effectiveness, while removing incompetent officers. He petitioned Gage, his former superior, to release captured Patriot officers from prison and treat them humanely. In October 1775, King George III declared that the colonies were in open rebellion, relieved General Gage of command for his incompetence, and replaced him with General William Howe as acting commander. Washington proceeded to New York City, arriving on April 13, and began constructing fortifications to thwart British attack. He ordered his occupying forces to treat civilians and their property with respect, to avoid the abuse suffered by civilians in Boston at the hannds of British troops. A plot to assassinate or capture him was discovered amidst the tensions, but failed, though his bodyguard Thomas Hickey (soldier) was hanged for mutiny and sedition. General Howe took his resupplied army, with the British fleet, from Nova Scotia to the city, considered the key to securing the continent. George Germain, who ran the British war effort in England, believed it could be won with one "decisive blow." The British forces, including more than 100 ships and thousands of troops, began reaching Staten Island on July 2 to lay siege to the city. After the Declaration of Independence was adopted on July 4, Washington informed his troops in his general orders of July 9 that Congress had declared the united colonies to be "free and independent states." Washington made repeated but futile petitions to the Continental Congress for provisions. He received a congressional delegation to check the Army's conditions, and expressed the urgency of the situation, proclaiming: "Something must be done. Important alterations must be made." He recommended that Congress expedite supplies, and Congress agreed to strengthen and fund the army's supply lines by reorganizing the commissary department. By late February, supplies began arriving. Militia forces captured André and discovered the plans, but Arnold escaped to New York. 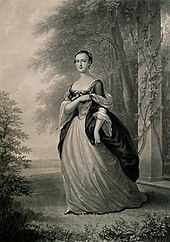 Washington recalled the commanders positioned under Arnold at key points around the fort to prevent any complicity, but he did not suspect Arnold's wife Peggy. Washington assumed personal command at West Point and reorganized its defenses. André's trial for espionage ended in a death sentence, and Washington offered to return him to the British in exchange for Arnold, but Clinton refused. André was hanged on October 2, 1780, despite his request to face a firing squad, in order to deter other spies. As peace negotiations started, the British gradually evacuated troops from Savannah, Charlestown, and New York by 1783, and the French army and navy likewise departed. The American treasury was empty, unpaid and mutinous soldiers forced the adjournment of Congress, and Washington dispelled unrest by suppressing the Newburgh Conspiracy in March 1783; Congress promised officers a five-year bonus. Washington submitted an account of $450,000 in expenses which he had advanced to the army. The account was settled, though it was allegedly vague about large sums and included expenses that his wife incurred through visits to his headquarters, as well as his agreed compensation. Washington reactivated his interests in the Great Dismal Swamp and Potomac canal projects begun before the war, though neither paid him any dividends, and he undertook a 34-day, 680 miles (1,090 km) trip to check on his land holdings in the Ohio Country. He oversaw the completion of the remodeling work at Mount Vernon which transformed his residence into the mansion that survives to this day—although his financial situation was not strong. Creditors paid him in depreciated wartime currency, and he owed significant amounts in taxes and wages. Mount Vernon had made no profit during his absence, and he saw persistently poor crop yields due to pestilence and poor weather. His estate recorded its eleventh year running at a deficit in 1787, and there was little prospect of improvement. Washington undertook a new landscaping plan and succeeded in cultivating a range of fast-growing trees and shrubs that were native to North America. Before returning to private life in June, 1783, Washington called for a strong union. Though he was concerned that he might be criticized for meddling in civil matters, he sent a circular letter to all the states maintaining that the Articles of Confederation was no more than "a rope of sand" linking the states. He believed that the nation was on the verge of "anarchy and confusion", was vulnerable to foreign intervention and that a national constitution would unify the states under a strong central government. When Shays' Rebellion erupted in Massachusetts on August 29, 1786 over taxation, Washington was further convinced that a national constitution was needed. Some nationalists feared that the new republic had descended into lawlessness, and they met together on September 11, 1786 at Annapolis to ask Congress to revise the Articles of Confederation. One of their biggest efforts, however, was getting Washington to attend. 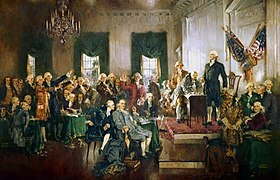 Congress agreed to a Constitutional Convention to be held in Philadelphia in Spring 1787, and each state was to send delegates. On December 4, 1786, Washington was chosen to lead the Virginia delegation, but he declined on December 21. He had concerns about the legality of the convention and consulted James Madison, Henry Knox, and others. They persuaded him to attend it, however, as his presence might induce reluctant states to send delegates and smooth the way for the ratification process. On March 28, Washington told Governor Edmund Randolph that he would attend the convention, but made it clear that he was urged to attend. 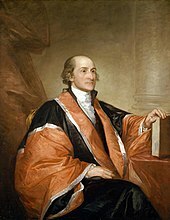 The delegates to the Convention anticipated a Washington presidency and left it to him to define the office once elected. [m] The state electors under the Constitution voted for the president on February 4, 1789, and Washington suspected that most republicans had not voted for him. The mandated March 4 date passed without a Congressional quorum to count the votes, but a quorum was reached on April 5. The votes were tallied the next day, and Congressional Secretary Charles Thomson was sent to Mount Vernon to tell Washington that he had been elected president. Washington won the majority of every state's electoral votes; John Adams received the next highest number of votes and therefore became vice president. 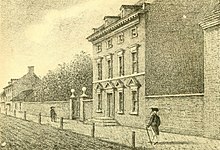 Washington had "anxious and painful sensations" about leaving the "domestic felicity" of Mount Vernon, but he departed for New York City on April 23 to be inaugurated. Washington was inaugurated on April 30, 1789, taking the oath of office at Federal Hall in New York City. [n] His coach was led by militia and a marching band and followed by statesmen and foreign dignitaries in an inaugural parade, with a crowd of 10,000. Chancellor Robert R. Livingston administered the oath, using a Bible provided by the Masons, after which the militia fired a 13-gun salute. 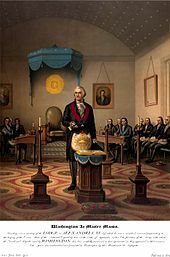 Washington read a speech in the Senate Chamber, asking "that Almighty Being who rules over the universe, who presides in the councils of nations—and whose providential aids can supply every human defect, consecrate the liberties and happiness of the people of the United States". He declined a salary, but Congress later provided $25,000 per year and he accepted, to defray costs of the presidency. During the Fall of 1789, Washington had to contend with the British military occupation in the Northwest frontier and their concerted efforts to incite hostile Indian tribes to attack American settlers. [o] The Northwest tribes under Miami chief Little Turtle allied with the British Army to resist American expansion, and killed 1,500 settlers between 1783 and 1790. Washington decided that "The Government of the United States are determined that their Administration of Indian Affairs shall be directed entirely by the great principles of Justice and humanity", and provided that their land interests should be negotiated by treaties. The administration regarded powerful tribes as foreign nations, and Washington even smoked a peace pipe and drank wine with them at the Philadelphia presidential house. He made numerous attempts to conciliate them; he equated killing indigenous peoples with killing Whites and sought to integrate them into European American culture. Secretary of War Henry Knox also attempted to encourage agriculture among the tribes. In the Southwest, negotiations failed between federal commissioners and raiding Indian tribes seeking retribution. 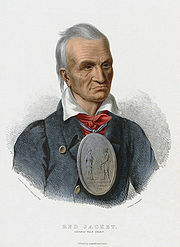 Washington invited Creek Chief Alexander McGillivray and 24 leading chiefs to New York to negotiate a treaty and treated them like foreign dignitaries. Knox and McGillivray concluded the Treaty of New York on August 7, 1790 in Federal Hall, which provided the tribes with agricultural supplies and McGillivray with a rank of Brigadier General Army and a salary of $1,500. St. Clair resigned his commission, and Washington replaced him with Revolutionary War hero General Anthony Wayne. From 1792 to 1793, Wayne instructed his troops on Indian warfare tactics and instilled discipline which was lacking under St. Clair. 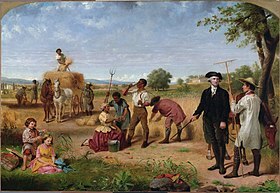 In August 1794, Washington sent Wayne into tribal territory with authority to drive them out by burning their villages and crops in the Maumee Valley. 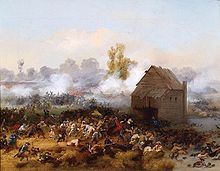 On August 24, the American army under Wayne's leadership defeated the western confederacy at the Battle of Fallen Timbers, and the Treaty of Greenville in August 1795 opened up two-thirds of the Ohio Country for American settlement. 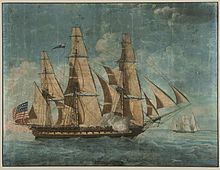 In March 1794, he signed the Naval Act which founded the U.S. Navy, and he commissioned the first six federal frigates to combat Barbary pirates. In 1795, he appointed Oliver Wolcott, Jr. as Secretary of the Treasury to replace Hamilton, who resigned in the aftermath of the Whiskey Rebellion. The upshot of the Rebellion strengthened Washington's bond with Hamilton, distancing him from Knox who resigned. Washington was thought to be rich because of the well-known "glorified façade of wealth and grandeur" at Mount Vernon, but nearly all of his wealth was in the form of land and slaves rather than ready cash. To supplement his income he erected a distillery for substantial whiskey production. Historians estimate that the estate was worth about $1 million in 1799 dollars, equivalent to about $20 million in 2018. He bought land parcels to spur development around the new Federal City that was named in his honor, and he sold individual lots to middle-income investors rather than multiple lots to large investors, believing that they would more likely commit to making improvements. 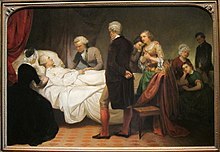 Washington's death came more swiftly than expected. At his deathbed, he instructed his private secretary Tobias Lear to wait three days before his burial, out of fear of being entombed alive. According to Lear, he died peacefully between 10 and 11 p.m. on Saturday, December 14, 1799 with Martha seated at the foot of his bed. His last words were, "Tis well", in his conversation with Lear about his burial. He was 67. Washington believed in a "wise, inscrutable, and irresistible" Creator God who was active in the Universe, contrary to deistic thought. He referred to God by the Enlightenment terms Providence, the Creator, or the Almighty, and also as the Divine Author or the Supreme Being. He believed in a divine power who watched over battlefields, was involved in the outcome of war, was protecting his life, and was involved in American politics—and specifically in the creation of the United States. [r] Modern historian Ron Chernow has posited that Washington avoided evangelistic Christianity or hellfire-and-brimstone speech along with communion and anything inclined to "flaunt his religiosity". Chernow has also said that Washington "never used his religion as a device for partisan purposes or in official undertakings". No mention of Jesus Christ appears in his private correspondence, and such references are rare in his public writings. He often quoted from the Bible or paraphrased it, and often referred to the Anglican Book of Common Prayer. There is debate on whether he is best classed as a Christian or a theistic rationalist—or both. Washington lived in Virginia and worked African slaves for all of his adult life. In Washington's day, Virginia's socio-economic structure largely depended on slave labor, most notably, on tobacco plantations. Washington owned Mount Vernon, a "substantial agriculture estate" that consisted of five farms. He inherited his first 10 to 12 slaves from his father and various family members, and through marriage to his wife Martha Custis. Between 1754 and 1768 Washington purchased 43 slaves. In February 1786, Washington took a census of Mount Vernon and recorded 224 slaves. Washington supported many slaves who were too young or too old to work and did not split up families, greatly increasing Mount Vernon's slave population and causing the plantation to operate at a loss in the process. He often spoke privately of freeing his slaves, but he never publicly condemned the institution of slavery, believing that the issue would divide the new nation. He was publicly criticized in Massachusetts during the Constitutional Convention for his ownership of slaves. While president, Washington maintained close supervision of Mount Vernon through letters to his overseers; there is one account from him authorizing a whipping that was given to a slave who had badly beaten his wife. At times, Mount Vernon slaves ran away to find freedom. To avoid any controversy, Washington often used secretive methods to return them rather than to post public advertisements in the North. [s] However, he placed ads for the recapture of five runaways between 1760 and 1771, offering handsome rewards for their apprehension. He wrote to Captain John Thompson in 1766, asking him to sell a slave whom he described as "a rogue and a run-away", expressing little concern for the slave's comfort. Washington recommended that Thompson keep him "handcuffed until you get to sea or in the bay." In 1790 Benjamin Franklin submitted a petition for the immediate cessation of the slave trade. Southern congressmen protested, threatening to "blow the trumpet of civil war", and Madison quickly Congress had no authority to outlaw slavery. Washington and Congress quickly supported Madison with a series of pro-slavery measures: citizenship was denied to black immigrants; African-Americans were barred from serving in state militias; two more slave states (Kentucky in 1792, Tennessee in 1796) were admitted; the continuation of slavery in federal territories south of the Ohio River was guaranteed; and in 1793, the Fugitive Slave Act passed, which allowed slave owners to cross state lines and hunt down runaway slaves. The Slave Trade Act of 1794, limiting American involvement in the Atlantic slave trade passed. Washington discouraged cruelty to slaves on his plantations yet there are records of harsh punishments inflicted on male and female slaves by their overseers, including whipping. He directed that a warning be given to first offenders before resorting to whipping, which was then subject to his prior approval; this was not always enforced, due to his prolonged absences. In other circumstances, he shipped recalcitrant slaves to the West Indies, selling one such at the price of "one pipe and quarter cask of wine from the West Indies". He also used forms of encouragement, including cash payments, material incentives, and "admonition and advice". Washington sometimes personally cared for ill or injured slaves, and he provided physicians and midwives. His slaves were inoculated for smallpox and they worked from dawn to dusk during the growing season. His slaves received two hours off for meals during the workday, and given time off on Sundays, Christmas, Easter, or Pentecost. By 1799, there were 317 slaves living at Mount Vernon; he owned 124 outright and held 153 for his wife's dower interest. During the summer, he made a new will which directed that his 124 slaves be freed upon Martha's death. He was among the few large slave-holding Virginians during the Revolutionary Era who freed their slaves. He provided that old and young freed people be taken care of indefinitely; younger ones were to be taught to read and write and placed in suitable occupations. Martha freed his slaves on January 1, 1801, a year after his death and a year before her own. Modern historian John E. Ferling has posited that Washington freeing his slaves through his will was "an act of atonement for a lifetime of concurrence in human exploitation". ^ The mid 16th Century word Indian described the Indigenous Peoples of the Americas. More modern terms for Indian include American Indian and Native American and Indigenous Peoples. ^ A modern term for Indian is Native American. ^ Chernow 2010, p. 3–6. ^ Chernow 2010, pp. 10–12; Ferling 2002, p. 14; Ferling 2010, pp. 5–6; Knott 2005, pp. 1–5. ^ Chernow 2010, pp. 10, 19; Ferling 2002, pp. 14–15; Randall 1997, p. 36. ^ Chernow 2010, p. 42. ^ a b Oxford Dictionary of Word Origins 2010, p. 222. ^ Chernow 2010, pp. 44–45. ^ Palmer 2010, pp. 370–371; Middlekauff 2015, p. 232. ^ Taylor 2016, p. 234. ^ Alden 1996, p. 221; Chernow 2010, p. 518; Ferling 2009, p. 266. ^ Fitzpatrick 1936, p. 523; Cooke 2002, pp. 9–10; Chernow 2010, p. 665. ^ "Founders Online: II, 14 December 1799". founders.archives.gov. Retrieved April 14, 2019. ^ Morgan 2000, pp. 279–287. ^ Chernow 2010, pp. 44–45; Morgan 2000, p. 291. ^ Wiencek 2003, pp. 122, 319, 348–349; Flexner 1974, p. 386; Hirschfeld 1997, p. 2, 13; Ellis 2004, p. 167. ^ Chernow 2010, p. 537. ^ Taylor 2016, p. 399. ^ a b Taylor 2016, p. 400. ^ Chernow 2010, p. 758; Taylor 2016, p. 400. Adams, Randolph Greenfield (1928). Allen Johnson (ed.). Arnold, Benedict. Dictionary of American Biography. Scribner. Akers, Charles W. (2002). "John Adams". In Graff, Henry (ed.). The Presidents: A Reference History (3 ed.). Scribner. pp. 23–38. ISBN 978-0-684-31226-2. Banning, Lance (1974). Woodward C. Vann (ed.). Responses of the Presidents to Charges of Misconduct. Delacorte Press. ISBN 978-0-440-05923-3. Cooke, Jacob E. (2002). 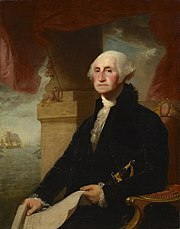 "George Washington". In Graff, Henry (ed.). The Presidents: A Reference History (3 ed.). Scribner. pp. 1–21. ISBN 978-0-684-31226-2. Julia Cresswell, ed. (2010). Oxford Dictionary of Word Origins. Oxford: Oxford University Press. ISBN 9780199547937. Fitzpatrick, John C. (1936). "Washington, George". In Dumas Malone (ed.). Dictionary of American Biography. 19. Scribner. pp. 509–527. Freeman, Douglas Southall (1968). Harwell, Richard Barksdale (ed.). Washington. Scribner. OCLC 426557. Jensen, Merrill (1948) . The Articles of Confederation: An Interpretation of the Social-Constitutional History of the American Revolution, 1774–1781. University of Wisconsin Press. OCLC 498124. Genovese, Michael A. (2009). Michael Kazin (ed.). The Princeton Encyclopedia of American Political History. (Two volume set). Princeton University Press. ISBN 978-1400833566. Morgan, Kenneth (2000). "George Washington and the Problem of Slavery". Journal of American Studies. JSTOR. 34 (2): 279–301. —— (2001). Don Higginbotham (ed.). George Washington Reconsidered. University Press of Virginia. ISBN 978-0-8139-2005-4. Tucker, St. George (1781). Riley, Edward M. (ed.). Journal of the Siege of Yorktown. The William and Mary Quarterly, July 1948. 5. Omohundro Institute of Early American History and Culture. pp. 375–395. Retrieved March 15, 2019.